Cucumbers grow well in most summer gardens. There are two main varieties to choose from. 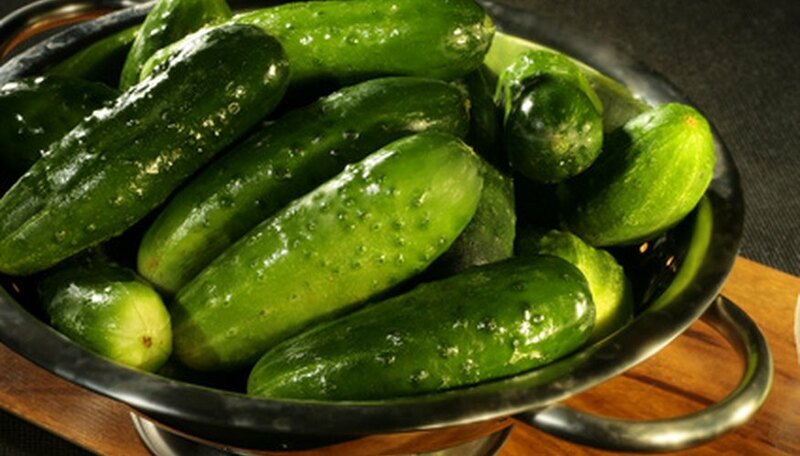 Salad cucumbers produce crisp vegetables that are suitable for fresh use in salads and sandwiches. Pickling cucumbers most often are pickled and preserved for later use in the kitchen. Starting cucumber seeds off right ensures they continue to grow well throughout summer. Cucumber does not transplant well, so it is best to start the seeds directly in the garden after all frost danger is past. Prepare a garden bed in an area that receives full-sunlight and has a well-drained bed that isn't prone to standing water. Lay a 2-inch layer of compost over the bed and till it in to a 10-inch depth. Sow each cucumber seed to a ½-inch depth. Sow seeds 2 inches apart in rows that are 3 feet apart. Water the bed after planting so that it is evenly moist. Keep it moist but not soggy throughout the growing season. Thin the cucumber plants when the seedlings emerge, approximately one week after planting. Leave a seedling every 8 to 10 inches for vining cucumbers and every 6 inches for bush cucumbers. Pull out the extra seedlings and compost or dispose of them. Lay a 2-inch layer of bark or straw mulch over the bed when the seedlings are 8 inches tall. Mulching preserves soil moisture, prevents weeds and helps keep the cucumbers off the soil surface. Water cucumbers once a week, providing 1 to 2 inches of water at each irrigation. Water twice a week during hot, dry weather if necessary. Vine cucumbers can also be supported on stake or grown in a cage, similar to tomatoes. In areas with a short season, start cucumber seeds inside four weeks before the last frost. Plant the seeds in plantable peat pots, otherwise the cucumber plants don't transplant to the garden well. Frost will kill the seeds or cause them to rot. Be sure all frost danger is past or cover the bed with black plastic mulch prior to planting to help keep the soil warm.